TheTravelzine Italy 2007 - Orvieto. Perched picturesquely on a tufa cliff, Orvieto is a popular stop for most folks visiting Umbria. The modern escalator, just across from the stazione FS whisked us to the top to Piazza Cahen where we boarded a bus to a stop near where we were staying, the Grand Hotel Italia, Via di Piazza del Popolo, 13. The hotel location is excellent, close to all the major attractions. The staff was accommodating and helpful. Our large bedroom and bathroom were modestly furnished and equipped for clean, basic comfort except for the leaky bidet and shower and poor lighting. CNN didnt work and we were assured that it would be adjusted soon, but it wasnt. This hotel also had high charges for connecting to the Internet, so we found the Biblioteca where there was one hour of free Internet per person, per day. Orvieto has Etruscan and Roman roots which can be seen in its architecture (the Gothic Duomo, 13th century town hall Palazzo Popolo and Papal Palaces), and its archeological and art museums. 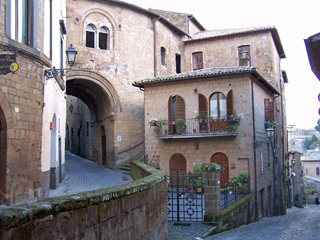 The town is shaped like an egg with Via Cavour running through the center from Piazza della Republica to Piazza Cahen. The major monuments and sights are in a tight radius around Piazza della Republica. We were warmly greeted at the biblioteca (Piazza Iscalza) and treated with great respect - that age thing. After catching up on our email, we headed across Via Signorelli to Via Duomo and onward to the jewel of Orvieto, the majestic Romanesque Gothic Duomo. 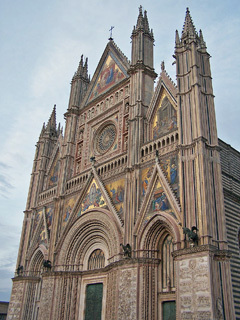 The facade is gracefully decorated by mosaics on a gold background. One of the major fresco cycles from the Renaissance is found in the Cappella di San Brizio. Other great works are the frescoes in the apse from the late 1300s, Madonna with Child by Gentile da Fabriano and a marble grouping of the Pieta by Scalza. Adjacent to the Duomo is the Palazzo dei Papi, the three palaces of the popes built in the 13th century, restored in the 1960s, which now house the National Archeological Museum and the Opera dei Duomo Museum. Across from the Duomo, the Palazzo dell'Opera del Duomo is a rare example of Baroque architecture in the city. It was originally built to house those who were building the Duomo. Next door is the Palazzo Faina - Museo, the site of the archeological and civic museums with Etruscan finds, ceramics, attic vases and coins. Next to the Duomo is the Torre di Maurizio, one of the oldest clock towers in Italy which was originally a sundial. The bronze statue, Maurizio, from 1348, looked down upon us. Not far from the Piazza del Duomo, it's possible to visit part of the vast underground complex inside the cliff with passageways, cellars, wells, cisterns, etc. Antica Cantina, at the corner of Via Cavour and Piazza Monalbeschi, a small osteria colorfully decorated with wine bottles, utensils and photos, was a spendid choice for dinner. We started with tagliatelle al ragu di coniglio (house made tagliatelle with rabbit ragu) and tortellacci neri ricotta e tartufo nero (giant black tortellini filled with ricotta cheese with shavings of black truffles); both were divine. The secondi of arista al latte (pork roasted in milk) and coniglio alla birra con polenta fritta,(stewed rabbit with fried polenta) were equally impressive. Excellent cooking and quality at very fair prices. If we thought the 4 star breakfast in Terni was bad, this 4 star rated hotel made it look good. The buffet was presented in a tacky room which matched the awful coffee from a machine, disgusting pale sugar water that was meant to pass for juice, rolls like rocks, pastries coated with shellac and poor-quality canned fruit. We hurried out to the nearby Piazza Popolo where the morning market was in progress and found a wonderful bakery cafe where we had excellent Illy coffee and pastries. The market was filled with the usual mix of food products from local farmers, clothing, house wares and domestics. It spread out around Palazzo del Popolo, an imposing Romanesque Gothic structure of stone and tufa, built in the late 1200s. It was renovated in 1991 and is now a conference site. Tucked in the western corner of town is the Chiesa di San Giovenale an impressive example of Romanesque art built at the beginning of the first century and enlarged in the fourteenth. The church houses some important frescoes of the Orvieto school. A short distance away is the spectacular Via dell Cava, lined with beautifully maintained medieval houses, sloping steeply down to Porta Maggiore, the oldest and westernmost entrance to the city. At the end of the street ancient stone and tufa homes are built into and around the tufa walls. Add to this the panorama of the rolling hills below, a glorious, memorable scene. We stopped for a mediocre lunch at Trattoria del Moro, Via San Leonardo 7. Linda's tagliatelle al cinghiale was good but my cinghiale alla cacciatora was fatty and tough (it's a good thing it was a skimpy portion). The mixed salad was a few leaves of assorted greens. However, we enjoyed some stimulating conversation with a father and son from Malta. The 13th century Palazzo Comunale (town hall) and 6th century (rebuilt from the 11th to 12th) Chiesa di Sant'Andrea dominate the Piazza della Republica, the hub of business and social activity. Both are in the Romanesque style with the church embellished by a portico and an unusual twelve-sided bell tower. A few steps away on Via Cavour is the Palazzo dei Signori Sette e Torre del Moro. It was built in the 13th century for a group of judges and the residence of several pontiffs. Today it is used for exhibitions and special events. The tower is particularly impressive with great countryside views from the top. We did find CNN working when we got back to the hotel and got caught up on the news before heading to Pizzeria Charlie, Corso Cavour, 194. There is a "Charlie" and he and his staff are wonderful hosts, lots of good fun and cheer. 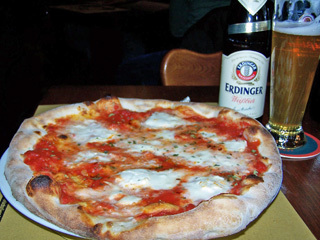 You come here for pizza (rosso and bianco) and beer. Sure there are a few salads, cortoni and calzoni offered, but it's the pizza (Napoli style) that makes it special. Linda chose the "pizzalolo", pomodoro, mozzarella di bufala, pacini and basilico. I the "originale", pomodoro, mozzarella di bufala, peperoncino and origano. Chewy crust, superb cheese and tomato sauce perfectly arranged and presented - masterpieces! Charlie recommended the Paulaner Hefe Weisbier, which was delicious. A trip to Orvieto is not complete without a stop at Pizzeria Charlie. Tomorrow, off to Rome.